Q: When I get relaxed during practice, my body shakes. Is it a good phenomenon? A: When the whole body is relaxed, the body becomes straight. In order to maintain a balance, there will be a natural mild shaking. Generally tall and upright objects have this slight shaking phenomenon. For example, we can find that the tower of the Observatory in Greenwich, England, shakes substantially if we see it from a distance. 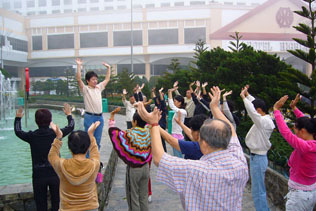 The shaking is a normal phenomenon when the body is relaxed. Last text: Q: Can we push our "sick qi" out during Level 1 – Lift Qi Up Pour Qi Down? Next text: Q: I get tired during qigong practice after drinking milk. How to deal with it?